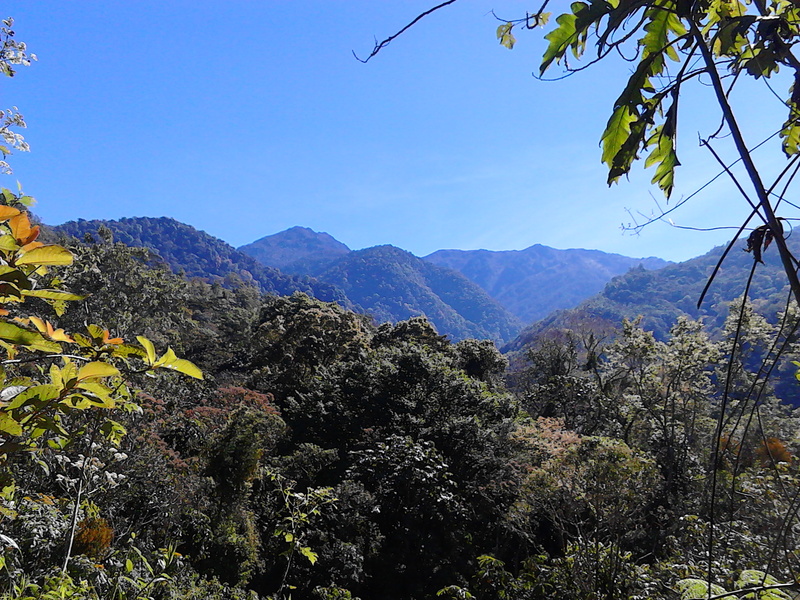 A view of Cerro Chirripo National Park from one of the hikes in Talamanca Reserve. It has been hot here in Esterillos so Randy and I decided to take a little trip into the mountains to cool off. We have read a lot about the tallest peak in Costa Rica, Cerro Chirripo. Unfortunately, it requires about three days minimum to summit and it would not be appropriate for Eloise (15 months old). The area surrounding Cerro Chirripo caught our interest and so we decided to make the trek up the mountainside to check it out. After a few internet searches we decided to stay at Talamanca Reserve. www.talamancareserve.com Kenneth and I exchanged a few emails and we were reserved for one night. We left late morning Saturday and took our time, stopping at a few different restaurants, etc. It probably took us about four hours to reach the reserve. We stopped for a longer lunch and we also got stuck in a standstill road construction line for at least 20 minutes. We were expecting horrible road conditions near the end, but were greeted with well-maintained roads all the way there. As you are get closer to San Gerardo de Rivas it does become a little narrower, but everyone is driving slowly so it is manageable. We stayed in the apartment over this house. The spiral staircase led up to the apartment. Once we arrived we were given a map, shown to our room, and left alone. As discussed, Kenneth had us staying in an apartment above a house a little farther away from the restaurant, but closer to the trails. It was just what we needed – tranquility! We spent the rest of the afternoon hiking. 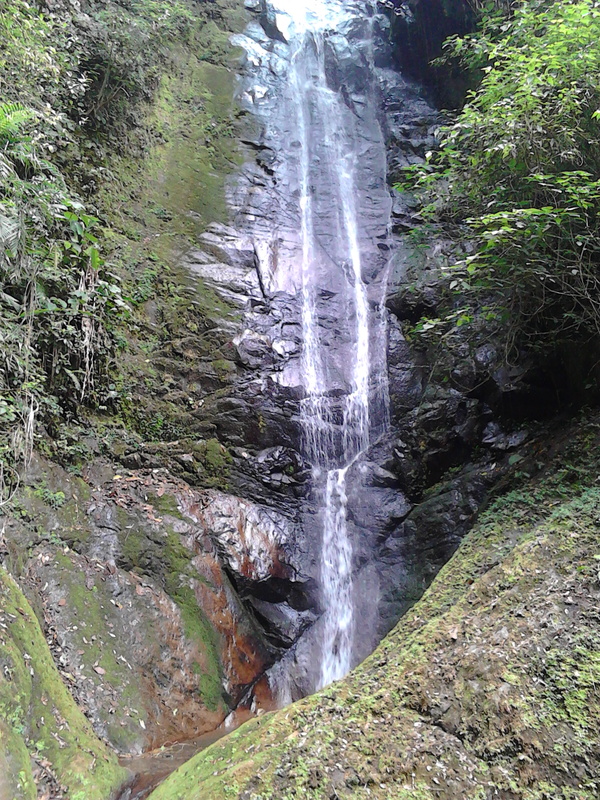 In the first few hours we were there we hiked to one of the many beautiful waterfalls and saw some monkeys. 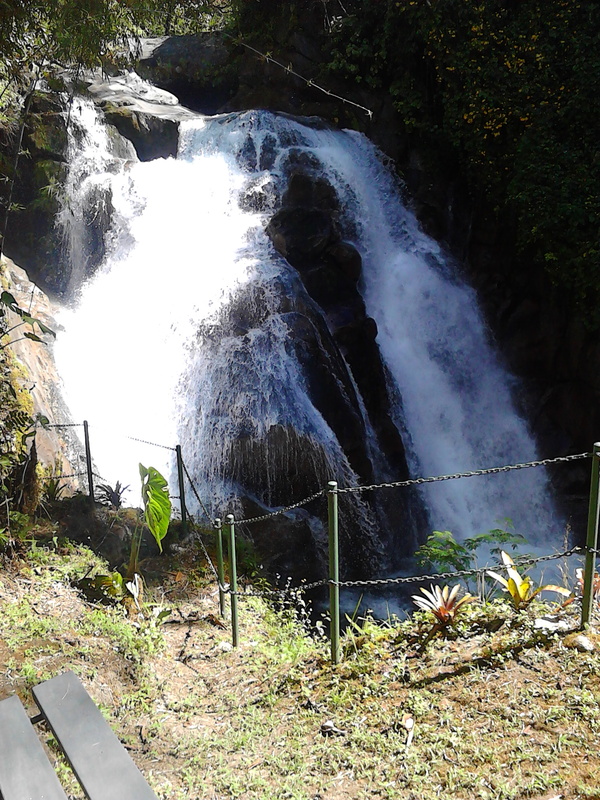 Cascada El Salto – It was so tall we couldn’t capture it in one photo. After a refreshing cold shower we headed down to the restaurant for their special dinner. Dinner started with a bowl of onion soup and bread, and then an entrée of grilled chicken, veggies, baked potato, and finished with key lime pie. Yum! Everything was delicious and it came with a very large glass of wine. I wish we had a picture to share, but we were so hungry we weren’t thinking about taking a picture. We slept well that night in the cool mountain air. The next morning we were up early. We ate our breakfast in the restaurant and had them pack up some chicken sandwiches for our hike. We hiked for about four hours. As we were descending down a trail to a very large waterfall, enjoying the smell of wild vanilla beans growing nearby, a coati ran passed us in the treetops. Apparently he was quite surprised to see us. Another cool sighting on Sunday was at the swimming hole. After a quick swim in the icy mountain water, I saw a bird go totally under water and then just hop right out. Later we identified it as the American Dipper. It was absolutely amazing to watch it dive in the water and emerge again as it worked its way upstream. On the way down to the swimming hole we encountered a fairly advanced trail. We were on a razor edge ridge that was held together by tree roots. The ground literally bounced with every step. I am glad Randy was the one carrying Eloise at the time. At times we had to go down using our hands, feet, knees, and butts. We tried to take a video and pictures of the trail, but it looks almost flat in all the attempts. We returned to our apartment safe and sweaty. Got ready and drove back to Esterillos. The trip back took a lot less time. Talamanca Reserve gets two thumbs up from this traveling family! 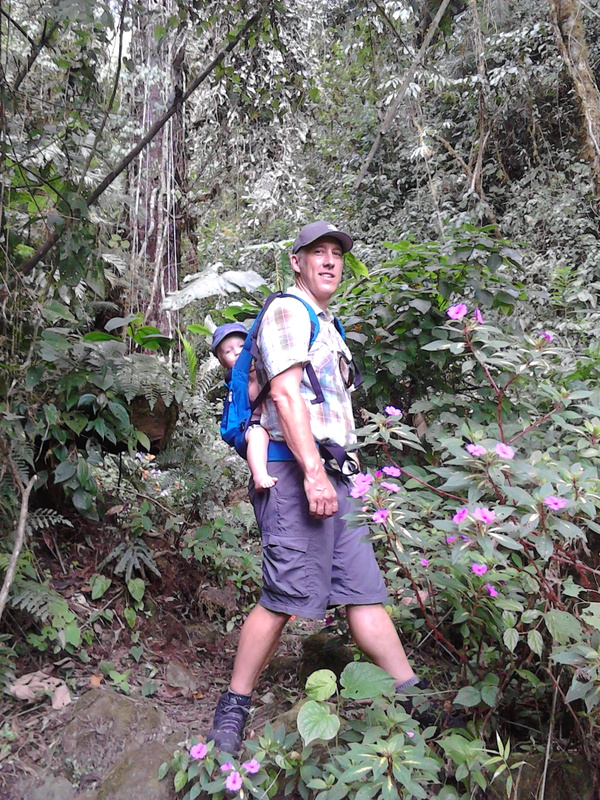 Randy carrying Eloise in the Ergo carrier through trails full of flowers.